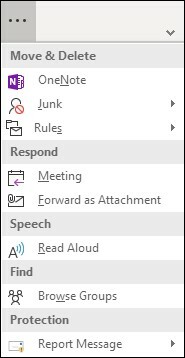 The Outlook Ribbon contains all the options and commands you use to accomplish tasks. You click buttons on the ribbon to create a new email, delete emails, open a new meeting request, or assign a category to an item, a highly useful tool. It does, however, take up a good deal of real estate on your screen. Microsoft is introducing a new feature in Outlook that gives you a new, simplified ribbon. 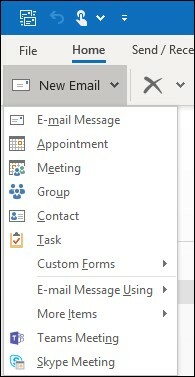 This smaller, more compact ribbon shows you the most common commands in a streamlined interface that resizes dynamically with your Outlook window. In the following graphic, the classic ribbon is on top and the Simplified ribbon is shown below. It will be easy to switch back and forth between the Simplified Ribbon and the classic ribbon. Just click the downward pointing caret in the lower right corner of the full, classic ribbon to collapse it to the Simplified Ribbon; click it again to expand it back to the Classic view. The Simplified Ribbon shows your most used commands in a single line, but, with less available space for commands, not all the buttons you're used to seeing will fit. If you don't see a button that you need on the Simplified Ribbon, you have several options. You can type the command you need in the Tell me what you want to do box at the top of your screen. Outlook will show you both the command you need and help for that command. If a button on the Simplified Ribbon has a downward pointing arrow next to it, click that arrow to see other, similar commands. For example, the classic ribbon has buttons for both New Email and New Items. In the Simplified Ribbon, all of the options that used to be under New Items can be found by clicking the arrow next to New Email. Other commands can be found by clicking the ellipsis () at the far right of the Simplified Ribbon. For example, from the Inbox, you can find a variety of buttons like Rules, Respond with Meeting, and Read Aloud. The Simplified Ribbon is fully customizable. You can pin or unpin your most used buttons for quick access. See Customize the Simplified Ribbon instructions. If you can't find one of the buttons you need, Microsoft has a reference guide for the Simplified Ribbon. Just find your button in the table and the guide will show you where it's located on the Simplified Ribbon.